If you are looking thoughfully to invest your money for a third-party Outlook to Lotus Notes tool to transfer your PST email data then your search for an appropriate converter can be met here in perhaps the most apt manner. Here we have a for you, a potent and proficient Outlook to Lotus Notes converter. MS Outlook to Notes Converter migrate the PST mailboxes to the Lotus Notes NSF file. It makes readable all the PST emails and its content in .nsf file after conversion. 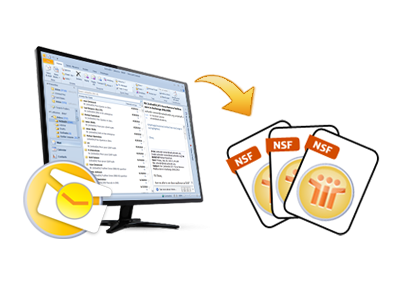 Software facilitates user by giving options to select the folders for conversion of PST file to NSF file. Conversion of some selective folders (Inclusion/Exclusion of Folders) will increase the migration speed. Set filters on Emails to get desired emails in NSF file. User can set Filters on emails by defining the date range of "From" and "To" during Outlook to notes migration..
Now user can set filters on Calendars as also on Emails. Also with this Calendar filter option user can migrate recurrence of calendar and get all the important entities of calendar set by user in PST file. With this Outlook to Notes Conversion tool user can stay with the same folder structure and mapping of PST file in new lotus Notes NSF file. It will never changed by our converter. User can set many filters on PST file items like on emails, Calendar entries and also on Tasks. User now doesn't require waiting for all data migration with this user can exclude the undesired items or data. Using this software user can exclude the Deleted Item folder from Migration and enhance conversion speed. This software will remove the folders and also can include the folders to the migration of PST to NSF. In Outlook to Notes Conversion process user can give his/her desired location to save the NSF file on local system. So when user going to define a location user can also create a new folder to save the NSF file. Does the Software works without MS Outlook installation on the system? No, the Software does not work without Outlook and Lotus Notes installation. Is it necessary to install both the mail clients on local machine? Yes, because our tool only can runable when you have Lotus Notes and MS outlook mail clients on local Machine. What to do when I get pre-requisites error regarding Lotus Notes? Domino Server connectivity should be off. Can I run this software on any other operating system like MAC OS, UNIX / LINUX OS? No, this software can run only on Windows operating System. It supports Windows 8 and all the lower versions of Windows Operating System.